Margaret Hilda Thatcher Signed 10x8 colour photo signed in black marker at the bottom of the image. Margaret Hilda Thatcher, Baroness Thatcher, LG, OM, PC, FRS (née Roberts; born 13 October 1925) was Prime Minister of the United Kingdom from 1979 to 1990. 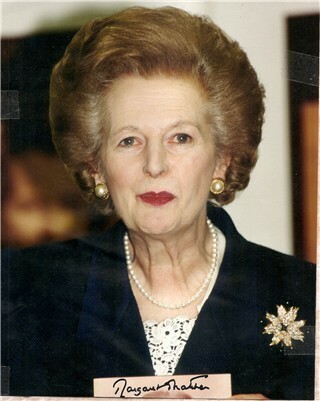 During her time as prime minister, Thatcher's strict conservative policies, hard line against trade unions, and tough rhetoric in opposition to the Soviet Union earned her the nickname, the "Iron Lady".